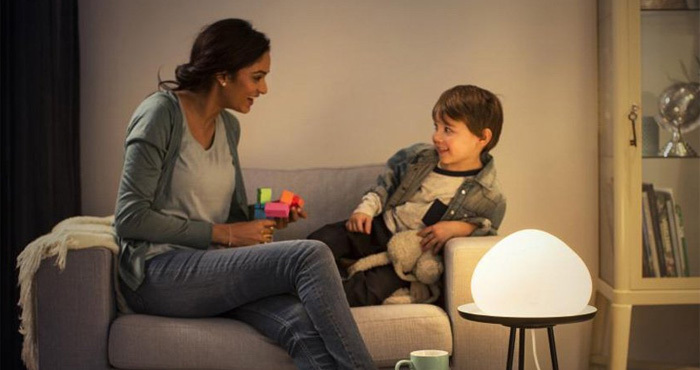 If you're looking for a smart, connected light bulb, Philips Hue is our favorite. Not only do these lights work with tons of smart home products — including Amazon Alexa, Apple HomeKit, Google Home, Samsung SmartThings and more — they provide a wide range of colors that you can easily control with your smartphone. Now, additions to the Hue line-up are about to make a good thing even better. First up is a brand new Philips Hue White Ambience candle bulb. Though Hue already offers a range of bulbs, the petite candle bulb is the smallest of the lot, with an E12 base and a light output of just 450 lumens. 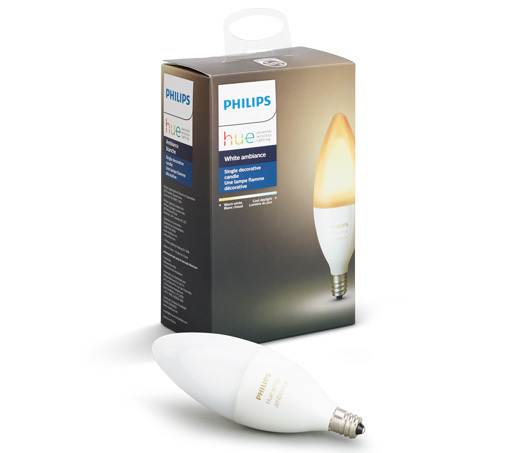 With this new bulb, Philips Hue lights can now be used in 80% of the average household's light sockets. This candle-size bulb will let you add ceiling fan lights, night lights and more to your Philips Hue network to control as part of your smart home. On top of the new bulb, there are four new fixtures designed just for Philips Hue: the Being, Fair, Wellner (shown above), and Wellness. All of them have a sleek, modern design that should fit in nicely with most homes. The Being and Fair are both overhead lights that will require some home DIY experience to install, but they're worth the trouble. Both lights look sharp, with the Being light mounting flush to the ceiling and the Fair light available as a flush-mount, semi-flush mount or suspension light to give you plenty of options. While either could suit any room in the home, the brighter Fair (up to 3000 lumens) is ideal for any room that could need bright light, like the kitchen. The Wellner and Wellness are both table lamps that offer up to 800 lumens of light. The two lights look different from one another: the Wellner is a rounded dome while the Wellness is more square. 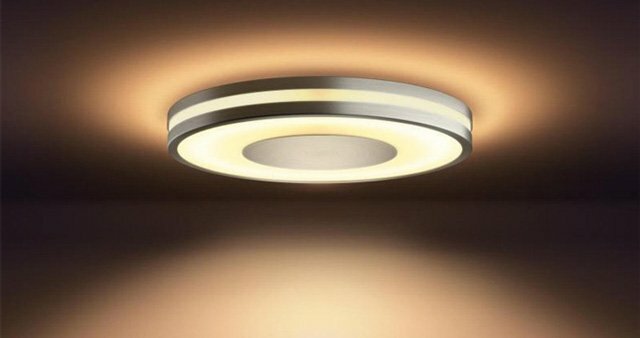 Either would be ideal for adding easily controlled smart lighting to any room. You can pre-order the Being ($199.99 on Amazon), Wellner ($199.99 on Amazon) or Wellness ($199.99 on Amazon) lights right now. 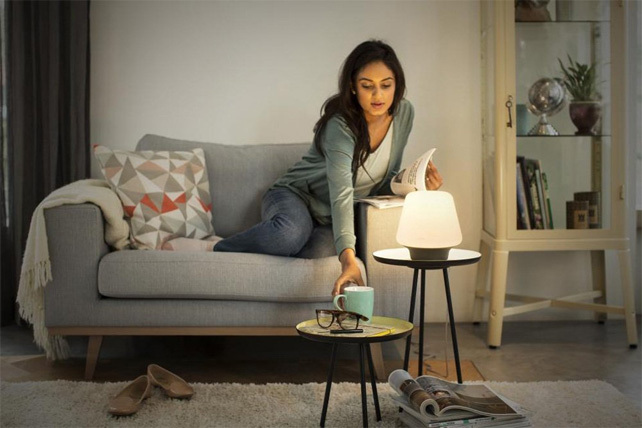 All come with Philips Hue White Ambience bulbs, so there's no need to buy anything else. These lights will start shipping on June 11, 2017. The candle bulbs ($29) aren't available for pre-order yet but will be starting in June. They'll ship in July, so there's not a long wait before you can get most of you home decked out in smart lights.